"Seriously, unless we were to go back to the Dred Scott decision, I fail to see how the Supreme Court could do otherwise than it did." THEODORE ROOSEVELT. Typed Letter Signed with extensive manuscript addition, June 3, 1901, to F. G. Fincke, Oyster Bay, New York. On "The Vice President's Chamber / Washington, D.C." letterhead, 1 p., 7¾ x 10¼ in. With envelope with pre-printed free frank. Oyster Bay, N.Y, June 3rd, 1901. 30 Genesee St., Utica, N.Y. If you think that decision made us lose morally in the eyes of Europe, you have a mighty poor conception of European morality! [below, in Roosevelt's hand] Seriously, unless we were to go back to the Dred Scott decision, I fail to see how the Supreme Court could do otherwise than it did; I should have felt another decision to be a real calamity, and am astounded at the narrowness of the margin in the vote. In 1898, the Treaty of Paris that ended the Spanish-American War granted the United States the Philippines, Puerto Rico, and Guam. The United States also retained jurisdiction over Cuba until its independence in May 1902. The acquisition of new territories immediately raised the issue of the legal status of their residents. According to the Treaty of Paris, those born in Spain could retain their Spanish citizenship or potentially become U.S. citizens. However, the native-born Puerto Ricans and Filipinos could neither retain Spanish citizenship nor become U.S. citizens. The Foraker Act of April 1900, largely authored by Secretary of War Elihu Root, established American rule in Puerto Rico for the twentieth century, giving the President the ability to appoint the governor, a portion of the legislature, and all of the justices of the supreme court. It also implemented a temporary tariff on goods transferred between Puerto Rico and the United States. In a series of six to nine cases decided in 1901, together called the Insular Cases, the Supreme Court held that the full constitutional protection of rights does not automatically extend to all places under American control. The Court created a distinction between incorporated and unincorporated territories. Incorporated territories were those that the government deemed to be on a path to statehood, such as Oklahoma, New Mexico, and Arizona. In the latter category, which included Puerto Rico and the Philippines, the Constitution did not "apply in full." Congress had the discretion to extend as much of the Constitution as it chose to these areas. cases on May 27, 1901, drew the largest crowd in Supreme Court history. In the first case, the firm of Dooley, Smith & Co. sued the United States for refund of duties it paid under protest at the port of San Juan, Puerto Rico, on merchandise imported from New York between July 1898 and May 1, 1900, when the Foraker Act took effect. The court held that those duties paid before the ratification of the Treaty of Paris on April 11, 1899, were valid under the war power. Those paid after that date had to be refunded. In other words, at the ratification of the treaty, Puerto Rico ceased to be a foreign country and became a territory of the United States, until Congress legislated further upon the subject. In the second case, British subject Carlos Armstrong sued to recover duties he paid in San Juan for goods he imported from the United States between August 1898 and December 1899. The court applied the principles from Dooley v. United States and held that duties that Armstrong paid after the ratification of the Treaty of Paris in April 1899 and before Congress passed the Foraker Act had to be refunded. In the third case, merchant Samuel Downes sued U.S. customs inspector George R. Bidwell to avoid paying duties on oranges he imported from Puerto Rico, arguing that the Constitution provided for uniform "duties, imposts, and excises" throughout the United States. Justice Henry B. Brown (1836-1913) joined the four dissenters in earlier Insular Cases to declare that Puerto Rico was not properly part of the United States with regard to the revenue clauses of the Constitution. Therefore, the Foraker Act was constitutional in imposing duties on trade between the United States and Puerto Rico, such as Downes' oranges. Six days later, Vice President Roosevelt wrote this letter to his friend in upstate New York. Like other Republicans who favored the expansion of the United States, Roosevelt was pleased that the majority of the Court had decided that the new possessions belonged to the United States and were therefore under the authority of Congress, but that their inhabitants were not U.S. citizens. Roosevelt referenced the Supreme Court's notorious Dred Scott decision of 1857, which declared that the federal government had no power to regulate slavery in the federal territories, thus ruling the Missouri Compromise of 1820 to be unconstitutional. That case was only the second time that the Supreme Court had declared an act of Congress to be unconstitutional. The Dred Scott case also declared African Americans could not be American citizens. Apparently, Fincke was less convinced than Roosevelt about the wisdom of the decisions in Dooley, Armstrong, and Downes. 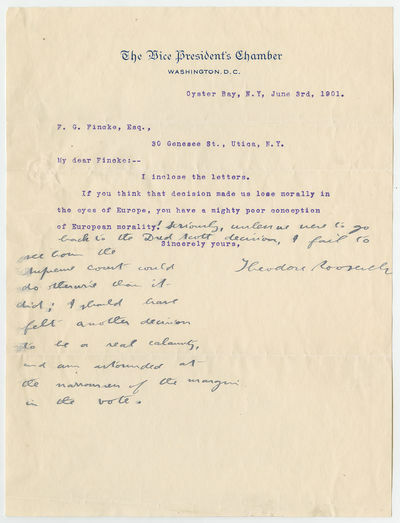 On June 6, Fincke wrote to Roosevelt, who responded the following day. The Vice President wrote from Oyster Bay, "Most emphatically I agree with the major part of your criticism about those decisions. I am wholly unable to get clear in my mind the principles upon which most of the judges acted and which resulted in such a higgledy-piggledy mixup in the two decisions, with the majority of the court seeming to occupy inconsistent positions." Admitting he was not a lawyer, Roosevelt continued, "I have never believed that a layman who thought soberly was incompetent to express a judgment upon the constitution and upon decisions which after all at bottom should express some public policy as well as law." He believed the primary difference between former Chief Justices John Marshall and Roger B. Taney was not "the technical propriety of their interpretation of law," but rather "their wisdom in what was really creating law." Roosevelt went on to express his paternalistic attitude toward territories inhabited by "others": "It has seemed to me perfectly obvious that if we had a right to prohibit slavery in the territories, to govern Alaska and the Indian Territory without their consent, and in an entirely different way to govern New Mexico and Arizona also without their consent, that it was a mere question of expediency whether we did or did not include the tariff in the catalogue of things which we managed for them on a different basis from the way we managed them for ourselves." He did agree with Fincke on one aspect of the cases, and again brought up the Dred Scott decision: "I agree with you entirely that the splitting up of the court and the highly technical nature of the differences on which they base their different decisions, have hurt them before the country. According to my view, the majority have come to substantially the right conclusion—at least in one instance; whereas in the Dred Scott decision the majority came to substantially the wrong conclusion. But there is an unpleasant resemblance in the way in which in each instance there was an entire lack of coherence and uniform judgment on the part of a substantial majority of the court, or of any clearly and simply formulated policy." On September 6, 1901, an anarchist shot President William McKinley twice in the abdomen. Although McKinley's condition initially improved, he died of infection caused by the wounds on September 14. Roosevelt, on a camping trip in the Adirondacks, took the oath of office in Buffalo. Two weeks later, Roosevelt wrote to Fincke, asking him to come to the White House when he traveled to Washington. Roosevelt continued, "Now, old man, you stood by me in every way when I really appreciated your support, and I should feel very honestly ashamed of myself, if my thoughts had not naturally turned to you at this time." On October 10, Fincke wrote to Roosevelt about a recent conversation he had with Congressmen Lucius Nathan Littauer and James S. Sherman from New York. "Both expressed not only respect & loyalty but affection for you," Fincke wrote. "There was no need of their talking through their hats or lying to me. They know I am not in politics & do not want to get in. I believe they meant all they said." "Situated as I am," Fincke concluded, "I think I get more honest & [unreserved?] expression, than I otherwise would." Roosevelt and Fincke continued corresponding at least through 1902. Theodore Roosevelt (1858-1919) was born in New York City, graduated from Harvard University in 1880, and attended Columbia Law School. He served in the New York State Assembly from 1882 to 1884, and as president of the New York City Police Commissioners in 1895 and 1896, then as Assistant Secretary of the Navy from 1897 to 1898. After service in Cuba during the Spanish-American War, he won election as Governor of New York and served from 1899 to 1900. He ran as Vice President to William McKinley in 1900 and became President in September 1901, when McKinley was assassinated. Reelected in 1904, Roosevelt was President until 1909. A prolific author and naturalist, Roosevelt was instrumental in the Progressive movement of the early twentieth century, helped preserve the nation's natural resources, and extended American power throughout the world with a focus on a modern navy. In 1912, he again sought the Republican nomination for President, but when the convention chose incumbent William Howard Taft, Roosevelt formed the Progressive Party and outpolled Taft in the general election. The Republican division allowed Democrat Woodrow Wilson to win the presidency. Frederick G. Fincke (1850-1912) was born in New Jersey and graduated from Harvard College in 1873. He studied law in New York City and graduated from Columbus Law School in 1875. Admitted to the bar that same year, he moved to Utica, New York, and developed a successful law practice. He served as attorney for the Second National Bank of Utica and the Delaware and Hudson Canal Company. He married Mary DeShon Wood (1851-1901) in 1875, and they had two children. Their daughter Frances (1876-1963) married eminent judge Learned Hand (1872-1961).